I managed to squeeze a quick visit in to the library tonight, which was lucky because my holds were beginning to pile up! Be sure to share your link so we can all come and check out your loot! Persuasion by Jane Austen - I mentioned in my goals for 2010 that one of the things I wanted to do this year was to read some Jane Austen. Aarti suggested that I start with Persuasion, and so I requested it. Hopefully I will get to it soon. The Hobbit by J R R Tolkien - I might have been a little excited when I finished reading The Hobbit last week. Not only did I read the book, but I also requested the graphic novel, which was illustrated by David Wenzel. The Hobbit by J R R Tolkien - This time the audio book. Beth from BethFishReads mentioned that the audio book version she listened to was awesome, so I thought I might try to listen to it again. The thing is, there is absolutely no information on the version I got from the library . This isn't the cover that I have, I don't know who the narrator is and can't even tell you whether this is an unabridged or abridged version. Guess it will all become clear eventually. The Summoning by Kelley Armstrong - This is reloot, and I hope to actually read this one this time! Another one that I have a different cover for from the library. Last time I borrowed the book it was this cover though! Tempting Evil by Keri Arthur - The third book in the Riley Jensen series. 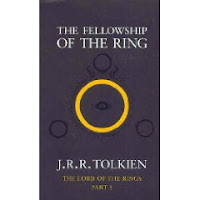 Lord of the Rings: The Fellowship of the Ring - Borrowed this in anticipation of the next part of the Lord of the Rings Readalong. The Struggle by L J Smith - Next book in the Vampire Diaries! Graceling by Kristin Cashore - Reloot! I have heard such good things about this author! Frostbitten by Kelley Armstrong - Next book in the excellent Otherworld series. 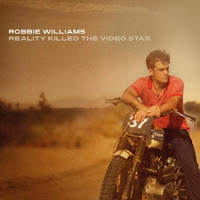 Reality Killed the Video Star by Robbie Williams - I was a big Robbie Williams fan from way back, although I wasn't all that fussed about what I heard from the last album. I am borrowing this one to see whether it is worth buying or not! Great loot. Mine's all new stuff this week! Great loot! I've had Graceling on my private shelf for over a year now! I HAVE to make the time to read it and FIRE soon! I've heard nothing but wonderful things for both novels. My daughter read The Summoning last year and loved it. I hope you enjoy it as well. 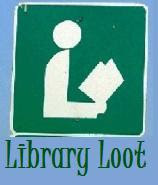 This is my very first Library Loot post that I've done. Hoping to participate all year! Angels is my favourite Robbie Williams song, too! I always think of it when I'm reading Meljean Brook's Guardian books. You got some great loot this week! I am going to have to check out the Otherworld series - looks like something I would like. A great set of books. 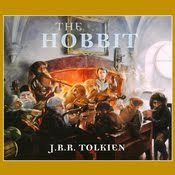 I like the idea of The Hobbit as a graphic novel and I will check to see if there's one in the Cornish library system. Lots of classics there, I like it!! I will also be interested in hearing what you thing of Graceling...I have read nothing but good things about that book! Hey Marg, I'd really like to join up with this meme. Review books are a rarity and I am getting back into visiting the library on a weekly basis. What day of the week do you post this and is it the same each day each week? I really enjoyed Graceling and The Summoning. I'm reading Persuasion on my Kindle, I really like it, it's my first time reading it. You have a few other books that I really need to read as well. Good luck, hope you get them all read this time. I hate returning unread books unless they are a DNF. Very tasty loot. I really liked Graceling, and just finished Fire, her next book. It looks like some great books there. Angels is my favourite Robbie Williams song as well. It should be, it's the song my husband and I did our first dance together. I have Robbie's new album but haven't had a chance to listen to it yet. But I've enjoyed the songs he's released..
Clover, I have listened to the Robbie album today a couple of times. It is an interesting mix and I like most of the stuff on it. A couple of the songs need to grow on me I think. Alaine, I hate returning unread books as well, but some times it happens. What can you do? J Kaye, the meme is usually posted each Wednesday, with the Mr Linky being hosted alternately her or at Eva's blog. Look forward to seeing you join in! Kat, I really need to read some Meljean Brook! I think I own her first book, but never managed to read it. Welcome to Library Loot Natasha! Look forward to seeing your posts through the year! Linda, yay for new loot! Eva, I just find it really odd that there is no mention anywhere on the CD case of who did the audio, year, narrator or anything. Very odd. Christine, I love most of Kelley Armstrong's writing so I can't think why this will be any different! Kristi, Kelley Armstrong has become one of my favourite authors since reading the Otherworld series. Give her a go! Fleurfisher, I haven't looked through it much yet, but I am looking forward to it. Beth and Zibilee, I have heard pretty much all good things about Graceling and Fire, so hopefully I will like them too. Well, I'm here today, not Wednesday, but yesterday I went to the library...finally! This is the first Library Loot post I've done. Thanks! Welcome to Library Loot Gayla and Jenn! Thanks for joining in Laurel! Those are all wonderful books! Great choices! I like your library loot!!! It's funny to see you want to read "Persuasion", because I'm starting it today! hahaha. Happy New Year! Some great choices there, I finally got mine up. Better late than never! Yay gotta love Rob,I think his new album is fab, a marked improvcement on the last one. I have Graceling on my TBR pile and one other of hers, hope to get to it soon.